When Ethiopian authorities announced the winner of the international design competition, many were amazed. Global architectural media noticed the unique selection of LAVA, Designsport and JDAW, which utilized cheap and ‘primitive’ sunken bowl construction to embrace Ethiopia’s heritage. Artificial craters would span over 67 hectares in eastern Addis Ababa, main one hiding the immense 60,000-capacity stadium under a façade of golden scales. Using sunken panful as both cheap and easy way of landscaping, architects were expected to fit the complex within a very modest budget of 1.6 billion birr (€60m / $80m). Even with very cost-effective measures that amount seemed extremely optimistic. After preparatory works were launched on site earlier this year, new evaluation followed. And resulted in a significantly increased budget estimate of 2 billion birr. Still very modest, the price apparently didn’t go further up because of design change. A much more conventional solution by MH Engineering, also ranked highly in terms of aesthetics back in 2012, proved a lot better in technical and financial terms than the first one. This time the leisure complex around the main stadium is nearly flat, though landscaping works include modifying the current waterbed of a canal running through the plot. 10,000 parking spaces and various secondary sports fields are to be built west of the main arena. The stadium with unchanged capacity of 60,000 fans will be covered by a distinctive dome. With a dynamic steel structure, the roof will be covered in decorated tensile membrane panels. All facilities are to meet FIFA and IAAF requirements. 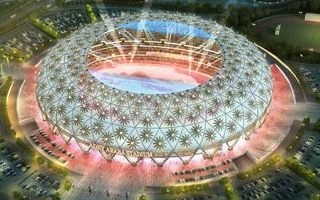 MH Engineering, who are behind Ethiopia’s largest and most modern stadiums already, are expected to carry out design works in upcoming months, in order to enable construction launch in 2015. Once started, the build should take two years to deliver.